Preoperative imagings of our patient with cervical fibrous dysplasia. (a) Lateral cervical x-ray. (b, c) Sagittal and axial section of computed tomography showing an osteolytic image with a sclerotic margin in the C6 vertebral body and a superior vertebral disc discontinuity compatible with a fracture. (d) Sagittal section of magnetic resonance imaging shows a lytic lesion at C6 with hypointense sign in T2. Postoperative imagings of our patient with cervical fibrous dysplasia. 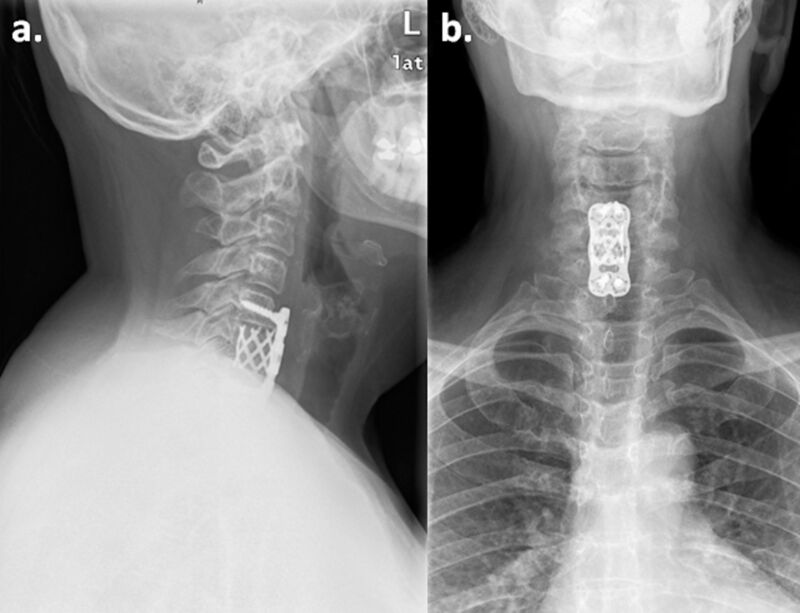 (a, b) Lateral and anterior-posterior cervical x-ray showing fixation with a titanium mesh cage with allograft bone at C6 level and an arthrodesis C5-C7 with ad anterior cervical plate.